As teased earlier, Xiaomi launched its latest Android One smartphone today in India. The all-new Mi A2 along with Mi A2 Lite was officially unveiled last month in Madrid. In India, the company is launching only the Mi A2. It is the successor to the Mi A1 smartphone launched in 2017. The device runs on the latest Android 8.1 Oreo out of the box and will also get the new Android 9.0 Pie update by the end of this year. The device sports metal unibody design and comes in Lake Blue, Gold, Rose Gold, and Black color options. There is a 5.99-inch IPS display with Full HD+ (2160×1080 pixels) resolution and 18:9 aspect ratio. On the top, the company is also offering 2.5D Corning Gorilla Glass 5 protection. Under the hood is the 14nm Qualcomm Snapdragon 660 Mobile Platform featuring Kryo 260 CPU and Adreno 512 GPU. In India, the Mi A2 will be available in 4GB and 6GB RAM variants with 64GB and 128GB of internal storage respectively. There is no MicroSD card slot for further expansion of storage on this device. 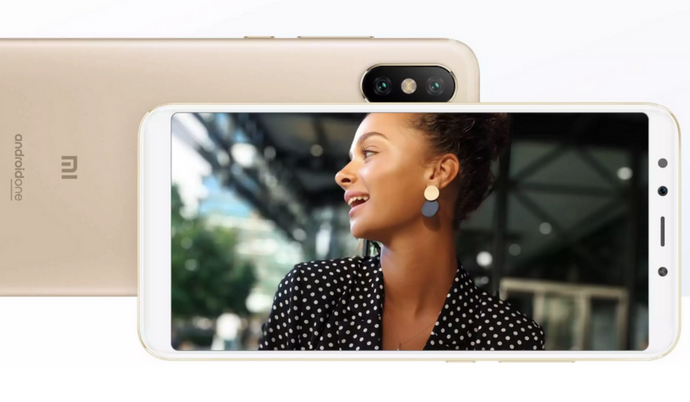 Talking about the cameras, the Mi A2 sports dual rear cameras featuring 12MP Sony IMX486 sensor with f/1.75 aperture, 1.25μm pixel size, EIS, and a 20MP Sony IMX376 sensor with f/1.75 aperture, 2.0μm pixels. For selfies, the device features a single 20MP Sony IMX376 sensor with f/2.2 aperture, 2.0μm pixels size, and soft LED flash. Though there is a rear-facing fingerprint sensor, the device can also be unlocked using the face unlock feature. It measures 158.7 × 75.4 × 7.3 mm and weighs 168 grams. Connectivity options include 4G VoLTE, Wi-Fi, Bluetooth 5.0, GPS, IR Blaster, and USB Type-C port. There is no 3.5mm audio jack on this device. It is backed by a 3,010mAh non-removable battery and comes with a 5V/2A power adapter. As the device supports Qualcomm Quick Charge 4.0+, the user have to buy a compatible adapter separately to charge the device faster. Initially, the company will only sell the 4GB RAM variant in India and the 6GB RAM variant will be available soon. Coming to the pricing, the MI A2 Android One smartphone with 4GB RAM and 64GB of internal storage will be costing Rs 16,999 in India. The device will be available to pre-order starting tomorrow and sales start from August 16th. It will be exclusively sold via Amazon India, Mi.com, and Mi Home stores. Stay tuned on PhoneRadar for more updates! The post Xiaomi Launches Mi A2 Android One Smartphone with Snapdragon 660 SoC in India for Rs 16,999 appeared first on PhoneRadar.